Junior forward Ashley Lewis takes the ball downfield against Albany State on last Friday. 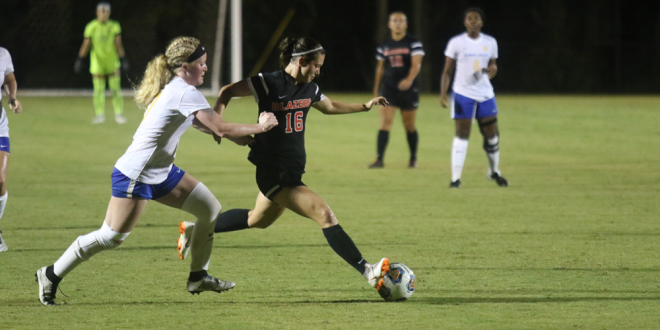 On the last day of August, VSU Women’s Soccer faced off against the Albany State Golden Rams for the first game of the season, and it didn’t take long for the Lady Blazers to find the back of the net. The Blazers rained in five scores to shut out the Golden Rams 5-0. Junior forward Ashley Lewis opened up the scoring with a goal from inside the box (24’), and just minutes later the score was doubled as Junior Riley Tennant lifted the ball into the top right corner of the goal (27’). The Blazers kept on pounding the Golden Rams in the first half with a brace for Lewis as she scooted the ball past the keeper and into the net (32’). Just before the halftime whistle, Freshman forward Lauren Hicks tallied another goal for the Blazers (43’). Sitting on a 4-0 lead heading into the second half, the Lady Blazers felt comfortable enough to sub on some new players. The second half was slower, but methodical for VSU. The ball was continuously crossed into the box creating chances for goals, and it wasn’t until the final minute of the match when Hicks headed the ball past the Golden Rams goalkeeper to complete her brace (89’). The Lady Blazers out shot Albany State 26-2, and the defense stood tall as the Golden Rams earned no corners throughout the entirety of the match. The Blazers earned 11 corners. After the game, Head Coach Stephen Andrew talked about his roster and how he utilizes all their talents. The Lady Blazers are back at the VSU Soccer Complex against Southern Florida on Friday, September 7 at 7 p.m. Written by Ray Hannah, Staff Writer. Photo Courtesy of VSU Athletics.